The old and the young… – …STILL CRAZY AFTER ALL THESE YEARS! I guess everyone loves ice cream, never mind old or young but of course, like everything else, especially when one is getting on in age, one should go a little bit slow on things that are sweet. …have been around the vicinity of the grocer & deli here for quite sometime now, even before the month of Ramadan but I had not seen them open, not even once. …but I never had the chance to enjoy it here. At one time, there was a sign stating that it was closed because the ice cream machine was out of order. …at only RM3.00 – I remember it was RM3.50 at the shop. …take it or leave it. The young boy said that if we wanted the freshly-made ones, we would have to go to the shop for that. 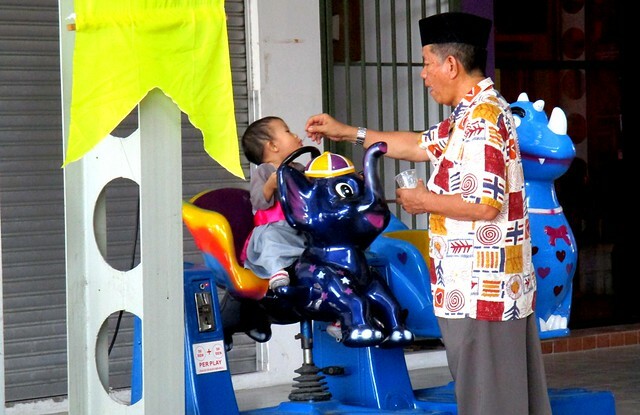 The little girl, probably his grand-daughter, was enjoying the ride and he was feeding her the ice cream at the same time – one scoop for her and three scoops for himself. LOL!!! I think sometimes the elders would do that to finish it off quickly so the kid would not eat too much. Cold, they would say, nanti batuk! (You’ll end up with a cough later!) If there is still any in the cup, of course, the kid would want more and more and would not take no for an answer. Somehow it made me feel warm inside watching the young kid mouth wide open and wanting more and the old man giving it to her so very affectionately. 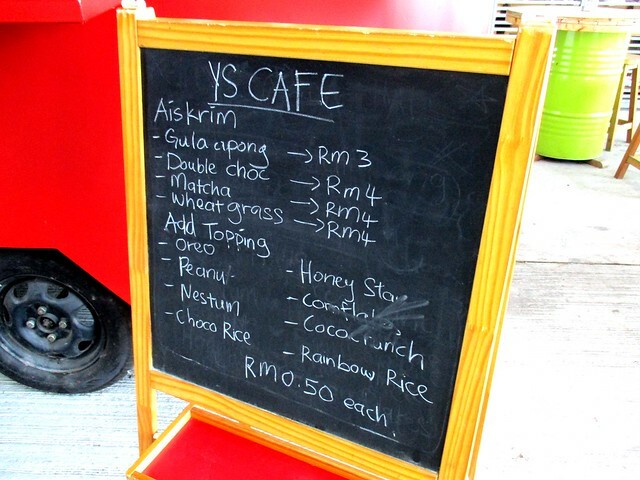 THE YS CAFE FOOD TRUCK (2.307981,111.820533) is located in the open area in front of the Bisonte Grocer & Deli, to the left of Mia Cafe & Restaurant that faces Jalan Kuda, off Jalan Kpg Nangka, beside the Simpang Tiga roundabout. 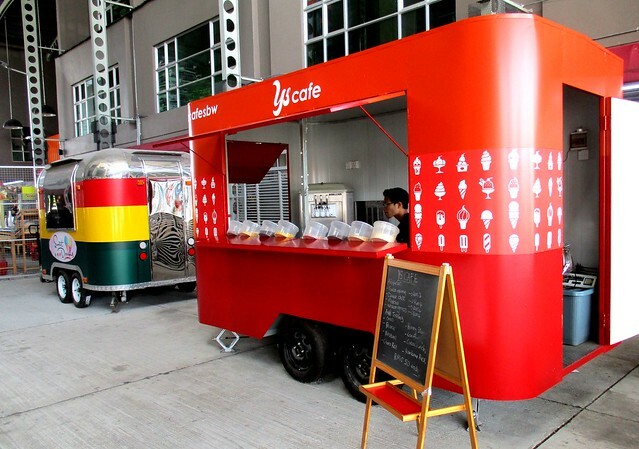 Doing business in this food truck is a trend now. I have seen one of them at Jalan Song selling ang tao peng and other drinks and another at Megabites, Samarahan selling sushi and etc. Has been quite a while not having the once upon a time famous gula apong ice cream at Open air market. Actually this one is too sweet for my liking. I prefer Sunny Hill ice cream but there is always a long queue. I think there are more, just that you do not know of their existence. Seen people sharing photos on Facebook, India Street/Kai Joo Lane area somewhere. Doesn’t seem to be catching on here, only these two, nowhere else. Sunny Hill has been around since the 60’s/70’s. 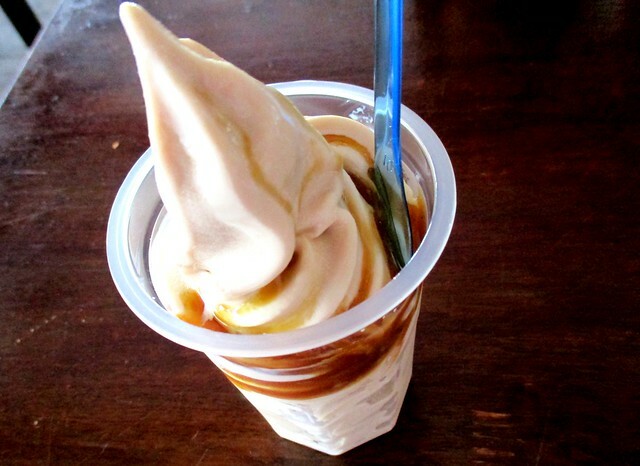 We do have that kind of soft serve ice cream at a few places here, even McD has as well. Nothing special – it was just the trend for younger people in those days, a place to cycle to and hang out with friends, like St Mike. I was one of them! 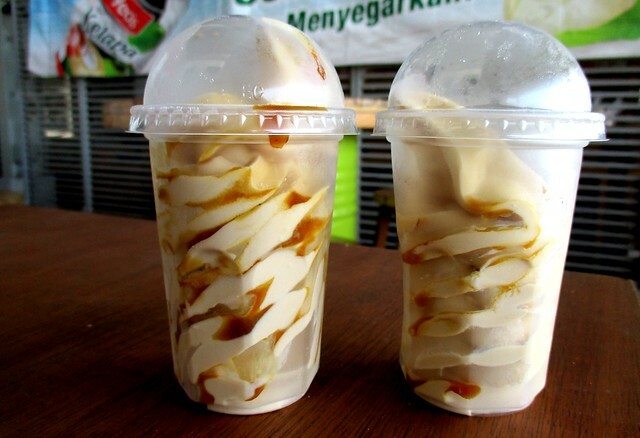 I did not like the gula apong ice cream in Padungan, did not get to try the Open Air one. The Padungan one was not soft serve, not creamy, not the same as this one here – like our young days’ ice cream, 5 sen a cone – the guy going round carrying it in a thermos container, scooping out using a spoon. We sure loved it then – don’t think many will be interested these days especially when there were reports of the people making it doing it on the floor using a shovel. Terrible! Premade and frozen ones are better than none! I wonder whether I could get gula apong soft serve here in the klang valley as I wouldn’t say no to ice cream and soft serve. Yes, a little harder but the taste is there. This one, the ice cream is gula-apong flavoured – I had one elsewhere and it was vanilla and they poured a bit of the gula apong syrup on it, not as nice , of course. Hot day, I am craving for ice cream. I have stocks of ice cream and ais potong in my freezer waiting for me after back from outside. Haha. Geez. Hope they fix the machine soon. Already rosak for so long, don;t think they have any intention to get it fixed. I don’t like the coffee shop, always crowded and they have their prayers going on the whole time. Would rather buy from there and take away, eat in the car. yes, that’s what we always do when offering ice cream to the kids. 3 scoops for us, 1 for them.. and we finish it off fast so they can see the cup is empty. NO MORE 😛 ..
You too, eh? Muahahahahahahaha!!! Otherwise, there will never be an end to it – they will want more and more! Yes, ice cream is definitely for the young and the seniors… I for one is an ice cream fan!! Muahahahahaha!!! Don’t want to use the word “old”, is it? In Malay, a lot nicer – warga emas”! I for one love ice cream at any age hah..hah… Those premium ones don’t come cheap and I look out for special promotions. I will only buy any new flavours to try but if they are any nice, I will stock up in the freezer for my girl to enjoy. Papa mah! Pingback: You drive me crazy… – …STILL CRAZY AFTER ALL THESE YEARS!